It’s been awhile since I've had a Weekend Beerventure. I've been looking for a good time to hit the road again and with a 3-Day Independence Day weekend in front of us Deana and I decided to hop in the car and seek out the local suds. The weekend started off with a trip to Union Craft Brewing. Not really a Beerventure from Baltimore, but it's how the weekend began so that's where we'll start. Depending on your disposition you might see the glass as half full or half empty, but one thing we can all agree on is that your Union growler should always be completely full. That’s especially true when Old Pro Gose is flowing through the tap system. Old Pro is tart, slightly salty, and the most satisfying local beer around during the summer months. If you've yet to get your hands on a pint of Old Pro it sounds like you need to schedule a beerventure of your own and rectify the situation. With our growler filled to the brim and a couple pints of Union Anthem patriotically chugged Deana decided we needed to kick our Fourth of July celebration into high gear and find some BBQ. While discussing our dinner options the rain was starting to come down hard and since I've been hearing about Blue Pit BBQ located just seconds up the street from Union we decided to race through the rain and head for the BBQ. Only one problem existed with the plan. Blue Pit BBQ isn't scheduled to start serving BBQ until later in the summer. Safe from the rain and surrounded by a myriad of whiskey we decided to stick around anyway. And besides, we weren't completely left without any food options. There was a limited but enticing menu of Binkerts sausages and a cheese plate on offer. Deana chose a Weisswurst in hopes of reliving our travels in Germany, but we both agreed that I won the Sausage Selection Extravaganza when I decided to try the Debreziner. The word debreziner was new for me, but it’s essentially a delicious mix of pork and beef meat. In other words, it’s a damn fine hot dog. 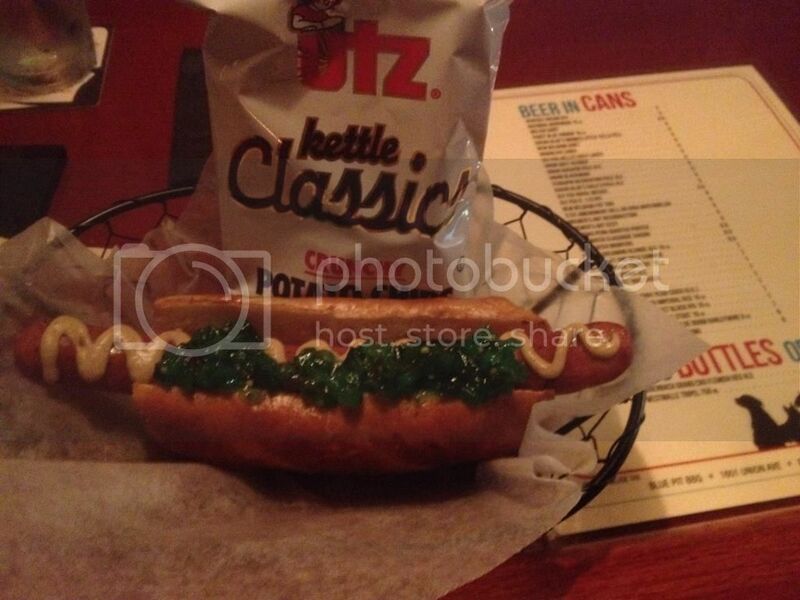 Though, topped with deli mustard and a stunningly intense green atomic relish there is a reason you won’t ever confuse the debreziner at Blue Pit with an everyday hot dog. The atomic relish really lightened up an otherwise salty and savory bite and while freshness isn't a word that always comes to mind when thinking of sausages it makes for one of the more interesting condiments you’ll come across. Surprisingly (as far as my own preferences are concerned), an expertly crafted Old Fashioned served as the highlight of the night. Blue Pit has a fair amount of craft beer on hand, but since I already visited Union and I was in a whiskey bar it only made sense to order the libation they’re known for. Knowing next to nothing about whiskey I relied on the advice of the bartender as to which variety I should select to create the quintessential Old Fashioned flavor. I went with his recommendation of Elijah Craig and waited anxiously as he went about mixing the classic cocktail. What I received was a sublime amalgamation of smooth vanilla, citrus, and smoke flavors equally doing their part to take some but not all of the whiskey burn away. 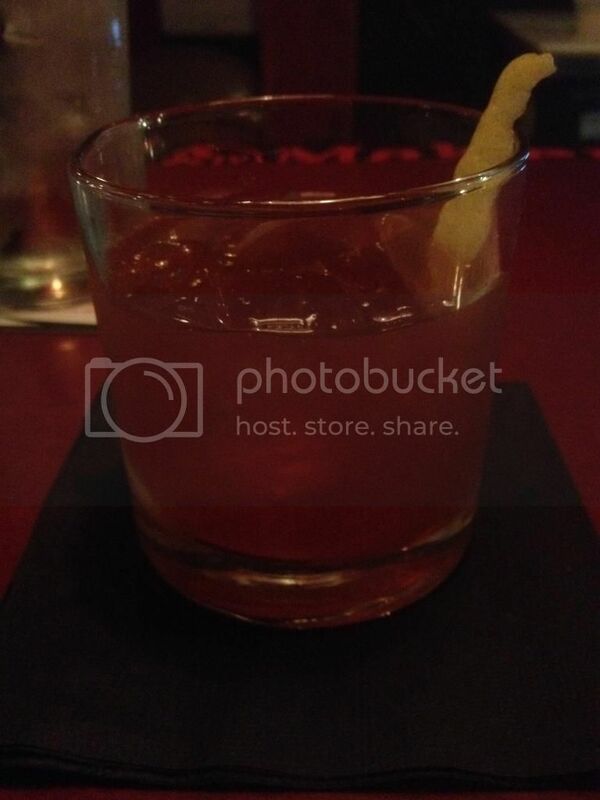 In no way do I consider myself a whiskey aficionado, but I would definitely order this drink again. Blue Pit BBQ might not have a fully functioning kitchen just yet but our visit showed enough promise to convince me that there is a lot to look forward to from them in the near future. Be on the lookout for the smoke and the meantime there are worse things you can do besides grabbing a sausage and sipping on premium whiskey.